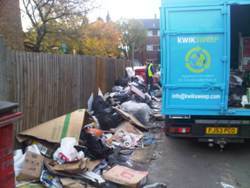 KwikSweep specializes in fly tipped waste and litter picking removal service for both private estates and local councils. Our experienced staff works in guidelines under section 33 of the Environment Protection Act 1990 and Clean Neighbourhoods and Environment Act 2005. 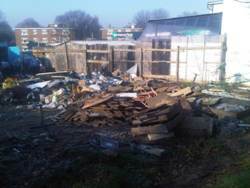 We understand that fly-tipping is a major problem in London costing millions of pounds a year. 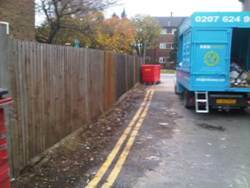 As a business we intend to reduce the amount of fly-tips being sent to landfill by recycling as much as possible. We currently work with a number of companies including Westway Development Trust covering 23 acres of land under the bridge. With our vast experience in the industry you can rest assured that all types of fly tipped waste can be removed within 24 hours and disposed or recycled in the right way. 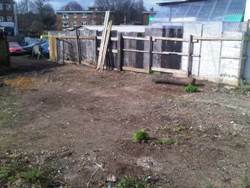 For further information about our fly-tipped waste removal in London, call us on 0207 624 9215 or email us now.